Mahjarrat Memories is a miniquest released on the 17th of March 2014. It is the follow on to the "Koschei's Troubles" Miniquest that was released on the 18th of February 2013. This miniquest is all about Divination, and Kharshai will have you trekking across the map to various locations, searching for the memories of known Mahjarrat. You will be looking for 15 memories in total - but it's far less simple than that. Talk to Kharshai beneath Thorvald the Warrior's house in Rellekka. However, it isn't nearly as simple as it sounds. For each Mahjarrat Memory, the Engrammeter must be recharged before obtaining a Mahjarrat memory. To recharge it, you must fill it with 500 regular memories, from Vibrant or higher. Enriched memories will count as two. Once you've charged up the Engrammeter you must go to a Mahjarrat memory site, and then click on the Engrammeter. Doing so successfully will drain the Engrammeter, and place a drifting memory of a Mahjarrat in your inventory. Take the memory to Kharshai, who will transcribe said memory into a book - which contain much lore on the backgrounds of Freneskae and the Mahjarrat. (If you destroy them, you can reclaim them from your player-owned house bookshelf.) And then, you begin the process all over again. Why Do They Have Emeralds In Their Heads? The locations of the Mahjarrat memories are below in alphabetical order. The final chamber of Enakhra's temple. The camulet teleport will take you directly there. Alternatively, you could use the Bandit Camp lodestone teleport. From the lodestone, walk southwest until you find a secret entrance near the quarry. Climb down this and then the nearby ladder and you should find yourself in a temple (this is where Enakhra's memory is). Climb up the ladder in the center of the floor, climb up the ladder past the magical barrier, and then climb over the pile of bones to the south. Now just climb down the stone ladder and click on your engrammeter to collect the memory. The end of Jaldraocht Pyramid, where you change to the Ancient Spellbook. The Pharoh's Sceptre can teleport you here and the area is just a short walk away from the Bandit Camp lodestone. The Daemonheim lobby. The Ring of Kinship will teleport you a very short distance away form here. The first room of Enakhra's temple. Teleport to the Bandit camp lodestone and walk southwest until you find a secret entrance. Enter it, and then climb down the ladder. The Hazeel cult cave at the end of the sewers beneath Ardougne. To get here, enter the cave entrance northwest of the monastery south of Ardougne. Board the raft and walk south to the room saturated with Hazeel Disciples. The centre of the cave which was used for The Tale of Muspah quest. Lodestone teleport to the Fremennik Province and enter snowy cave opening west of Olaf Hradson. Now enter the cave opening to the northwest and walk towards the center of the room to get Jhallan's memory. Where you began the miniquest, in Koschei the Deathless' arena. Lamistard's cave from the Curse of Arrav quest, OR in Zemouregal's fort. To get to Zemouregal's fort, teleport to the Glacor cave using DKQ fairy ring combo and exit the cave through the northern exit. Run west and enter the entrance to the fort. You will not need to kill the zombie or put in special coding this time. Lucien's abandoned house across the Edgeville river. The Temple of Senntisten, where you change to the Ancient Curses prayerbook. The Mahjarrat Ritual site, near the ritual marker. Teleport the Glacor cave using the DKQ fairy ring combination and walk northwest until you find the ritual marker. The centre of the Ghorrock fortress. To get to the Ghorrock fortress you can use the canoe in the snowy hunter area to get to the area west of the fortress and walk east OR use the DKQ fairy ring combination and use the rope to get to the area west of the fortress. 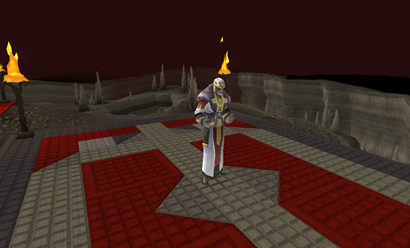 The Empyrean Citadel throne room, the place used in the Missing, Presumed Death quest. Use the invitation box from the Missing, Presumed Death quest to get here. If you have lost your invitation box, you can get another from Brother Samwell on the path to Paterdomus. Ali the Wise's house in Nardah. Zemouregal's base underneath the Chaos Temple in the Wilderness, in the room with maps and plans (which happens to be Zemouregal's office). This happens to be the hardest area to get to. You will need a Macaw pouch and insulated boots. Once you have these, speak to Hartwin, who will teleport you to an instanced version of the Chaos Temple in the Wilderness. Climb down the trapdoor and run past the zombies. When you reach an area where the path splits, you should see yellow trap mechanism and a kitchen. Enter the kitchen and make sure your insulated boots are on. Now enter the pipes and walk through the sewer until it ends. Summon your macaw and use the remote view option. The Macaw will automatically find a good time for you to enter the area. Now just run south until you find a room with maps and plans. This is where Zemouregal's memory is. Once you have the memory, teleport out. If you leave the area by other means, you will find yourself in the Wilderness. Upon bringing Kharshai the final memory, you will be given a great reward. On top of 25,000 Divination XP for each memory (totaling 375,000XP), you are awarded 150,000 bonus Divination XP, two new titles, a new pet, and a new hat override. This pet (accessed through the pets interface) is a follower pet that you can interact with. Behold his almighty power, and don't forget to give him time out when he tries to impale you with the toothpick of Armadyl. Now you can not only wonder at Azzanadra's fascination with pronged headgear - you can share it too! Also, Kharshai leaves you with the Emgrammeter, and wonders aloud to himself about it. He mentions that he gained extra power from the memories, but it would take a thousand years of gathering power at that rate to be of any difference. He also laments how all the memories found are ancient, all of old, and that they will not help in deciphering current plans of the Mahjarrat.